Good Monday morning. In a conversation I had recently with a loved-one regarding sound doctrine and the various Christian denominations, I was reminded of one of the strongest objections within Christian denominations, the practice of private confession and absolution. It is generally considered “a Catholic thing” but Lutherans also maintain this practice as one of the roles of the office of Pastor. I’m not here to review/critique their practice. I am interested, however, in the subject of confession, repentance, & absolution from a Biblical perspective. 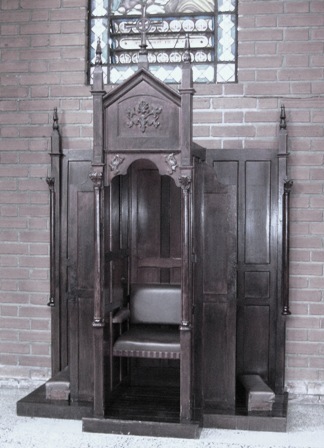 I could not find a way to discuss confession and repentance apart from Church Discipline. While the topic for today is one of practices within the Church, the Body of Christ, I do not want to skip over this by way of assumption. Regardless of your church practice, this discussion is not about absolving the unbeliever of sin. To enter the Body of Christ, one must be Converted or Born-Again by Grace, through Faith. Praise the Lord. Now, those who are saved in Jesus Christ still live in sinful flesh, and are in need of forgiveness and restoration every day until the hope of the upward call of Jesus (the Day of His Return and of our Resurrection in Christ). So, for those who do not believe in the Lord Jesus, what follows is of lesser concern. Matthew 6:14-15 (ESV) 14 For if you forgive others their trespasses, your heavenly Father will also forgive you,15 but if you do not forgive others their trespasses, neither will your Father forgive your trespasses. Still, this is not yet pointing to our topic of the day. There is something interesting that Jesus says to His disciples later in the text after Peter’s confession of Jesus as the Christ, Son of the Living God. Interesting. Growing up in a Pentecostal / Charismatic tradition, I’ve always heard this passage (highlighted portion) taught in the “spiritual warfare” sense. But here, it follows Jesus saying He will build His Church upon the confession of Jesus as the Christ, and that nothing will prevail against His Church. Rather than expound upon this further, let’s look at how this phrasing comes back up later in the text. I decided to leave the ESV section headings in this portion to better illustrate what the immediate context of this passage conveys. The context is within the Church. The Kingdom of Heaven, the sheep fold, is where the sheep have heard the Voice of Jesus, their Shepherd. Temptations will come, some will be led astray, and the Shepherd goes in search for the one who is lost and rejoices over its restoration. In verse 15, Jesus isn’t talking about “the world”; rather, He is talking about “your brother”. It is in this context that we see, again, whatever you bind on earth shall be bound in heaven… Interesting. Now, before we get too far beyond the fulcrum (thus tipping the lever too far in the other direction) notice that Peter’s question seeks a “limit” of sorts. This power of binding is understood as a responsibility rather than a privilege, and Peter is seeking an upper limit. Jesus doesn’t provide one; rather, He says that as long as your brother repents, you are to forgive. Remember what Jesus taught when the Disciples asked how to pray; If they do not forgive the sins of others, their sins will not be forgiven them. Still, this responsibility of binding and loosing remains. So, avoiding the sin of taking one passage over another, let us hold both to be true. On the Day of Christ Jesus’s resurrection, He says something very interesting when He breathes on them. Let’s turn to John chapter 20. Withholding forgiveness for the lost sheep must be a matter of judgement/discipline here, not just of a mere unbelief as would be expected of the Gentiles. For we see here in Matthew 10 that Jesus is first sending them to those who should know better, the lost sheep of Israel. We also see in Chapter 18 that there are many attempts to point out the sin of a brother before treating them as a Gentile or tax collector. There is a blatant lack of repentance in that passage that leads up to the binding and loosing charge. Thankfully, we are not left completely without an example of what this form this Church discipline is to take. The Apostle Paul, in his writings to the Church at Corinth, issues a judgement in his first letter, then offers praise and comfort in his second regarding what seems to be the same individual and situation. Let us turn to 1 Corinthians chapter 5. Wow… so much for the whole “thou shall not judge” that Christians wrongfully throw about, eh? God judges the world with Himself as the standard (the Law). We are to hold each other, within the Body of Christ, accountable to the Word of God, both for their benefit and for the building up of the Saints. Notice the strong language in verse 5. This isn’t the only time Paul phrases it this way, but Paul is issuing the order for the Church in Corinth to carry out. This is the Word of the Lord. The sinner, who bears the name of brother, is to be rebuked and delivered to Satan for the destruction of the flesh (the part of us that remains sinful) so that his spirit may be saved in teh day of the Lord. The purpose is for repentance, but if repentance does not come he is to be purged from among the brethren. 1 Since we have these promises, beloved, let us cleanse ourselves from every defilement of body and spirit, bringing holiness to completion in the fear of God. 2 Make room in your hearts for us. We have wronged no one, we have corrupted no one, we have taken advantage of no one. 3 I do not say this to condemn you, for I said before that you are in our hearts, to die together and to live together. 4 I am acting with great boldness toward you; I have great pride in you; I am filled with comfort. In all our affliction, I am overflowing with joy. 5 For even when we came into Macedonia, our bodies had no rest, but we were afflicted at every turn—fighting without and fear within. 6 But God, who comforts the downcast, comforted us by the coming of Titus, 7 and not only by his coming but also by the comfort with which he was comforted by you, as he told us of your longing, your mourning, your zeal for me, so that I rejoiced still more. 8 For even if I made you grieve with my letter, I do not regret it—though I did regret it, for I see that that letter grieved you, though only for a while. 9 As it is, I rejoice, not because you were grieved, but because you were grieved into repenting. For you felt a godly grief, so that you suffered no loss through us. 10 For godly grief produces a repentance that leads to salvation without regret, whereas worldly grief produces death. 11 For see what earnestness this godly grief has produced in you, but also what eagerness to clear yourselves, what indignation, what fear, what longing, what zeal, what punishment! At every point you have proved yourselves innocent in the matter. 12 So although I wrote to you, it was not for the sake of the one who did the wrong, nor for the sake of the one who suffered the wrong, but in order that your earnestness for us might be revealed to you in the sight of God. 13 Therefore we are comforted. And besides our own comfort, we rejoiced still more at the joy of Titus, because his spirit has been refreshed by you all. 14 For whatever boasts I made to him about you, I was not put to shame. But just as everything we said to you was true, so also our boasting before Titus has proved true. 15 And his affection for you is even greater, as he remembers the obedience of you all, how you received him with fear and trembling. 16 I rejoice, because I have complete confidence in you. There was repentance, and it was felt by the body of Christ. Paul doesn’t just single out the individual in this letter; rather, he points to assembly. Paul wasn’t just dealing with the singular matter issued in 1 Corinthians. Paul’s closing comments in Chapter 13 offer some encouragement (both tough and kind). 2 Corinthians 13:5-14 (ESV) 5 Examine yourselves, to see whether you are in the faith. Test yourselves. Or do you not realize this about yourselves, that Jesus Christ is in you?—unless indeed you fail to meet the test! 6 I hope you will find out that we have not failed the test. 7 But we pray to God that you may not do wrong—not that we may appear to have met the test, but that you may do what is right, though we may seem to have failed. 8 For we cannot do anything against the truth, but only for the truth. 9 For we are glad when we are weak and you are strong. Your restoration is what we pray for. 10 For this reason I write these things while I am away from you, that when I come I may not have to be severe in my use of the authority that the Lord has given me for building up and not for tearing down. 11 Finally, brothers, rejoice. Aim for restoration, comfort one another, agree with one another, live in peace; and the God of love and peace will be with you. 12 Greet one another with a holy kiss. 13 All the saints greet you. 14 The grace of the Lord Jesus Christ and the love of God and the fellowship of the Holy Spirit be with you all. The Church is to encourage and build up one another, and that includes rebuking sin. We see that for those who repent of their sin, forgiveness is assured. We who are called brothers and sisters in Christ, have been filled with the Holy Spirit and charged with binding and loosing. We’ve also been charged to forgive our brother and sister who repents of their sin against us. Is taking confession and pronouncing absolution a specific role of the Pastor? I don’t see that in Scripture. However, I do see that we need to confess our sins, repent, and forgive others, and I know that in Christ we find our forgiveness. I don’t like the formulaic approach to routine confession-absolution in private, nor of the ceremony of corporate absolution (Lutheran Liturgy) mainly because I know that “going through the motions” is a big problem for me. What I would like to say is that people need to hear “your sins are forgiven” regularly. We need the Gospel of Jesus Christ daily, for we have not yet attained the perfection of Christ (and will not until we join in His resurrection on the final Day). Whether it is in Bible study, personal counselling, or mentorship, each member of the Body of Christ needs to understand the need to confess their sin one to another, knowing that in Christ there is the Forgiveness of sin. We need to hear “you are forgiven” from a reliable source, the Word of God. And sometimes, it really helps to hear these words spoken over us, particularly in the midst of godly grief. The world understands this need, but their answer is to gossip and to tell each other that what they did wasn’t wrong and that they are better people for it. They invent “laws of attraction” and “positive thinking”… actually… it seems much of the visible church has been selling these same lies lately. The tyranny of “positive thinking” is that it prevents Christians from confessing and repenting of their sin. In some cases… it prevents even acknowledging sin to be sin… May God forgive us for calling good evil, and evil good. 13 Is anyone among you suffering? Let him pray. Is anyone cheerful? Let him sing praise.14 Is anyone among you sick? Let him call for the elders of the church, and let them pray over him, anointing him with oil in the name of the Lord. 15 And the prayer of faith will save the one who is sick, and the Lord will raise him up. And if he has committed sins, he will be forgiven. 16 Therefore, confess your sins to one another and pray for one another, that you may be healed. The prayer of a righteous person has great power as it is working. 17 Elijah was a man with a nature like ours, and he prayed fervently that it might not rain, and for three years and six months it did not rain on the earth. 18 Then he prayed again, and heaven gave rain, and the earth bore its fruit. 19 My brothers, if anyone among you wanders from the truth and someone brings him back, 20 let him know that whoever brings back a sinner from his wandering will save his soul from death and will cover a multitude of sins. Rebuke a brother/sister who has sinned against you in love, confess your sin against your brother/sister to him/her in love, and forgiven each other and pray for one another in love. For those who are constantly looking to define “Advanced Christianity”… this is it, and it is not of ourselves, it is a Gift from God.